These days, many companies have constantly shifting inventory, a limited budget for storage material, and the need to make existing racking last as long as possible. For such facilities, the boltless pallet rack is a worthy option. "Industries which benefit the most from boltless pallet racks are those with the need to adjust their storage rack configurations on a frequent basis, as the products they handle change with increasing frequency. The ability to move shelf levels without tools is the biggest benefit of boltless rack," says Jay Anderson, president of Steel King Industries, Inc., a leading manufacturer of materials handling products for warehousing, distribution and manufacturing industries. Boltless pallet racks have their primary advantages in a low purchase price, the ability to assemble without tools, and ability to carry heavy loads. A third-party installer is not always needed to adjust storage positions, as the shelf levels can be easily adjusted. It is important to note however that beam level location affects load carrying capacity, so users should verify with the manufacturer that the racks will work safely in the new configuration before making any adjustments. Buyers of new racks, however, are discovering that the traditional open-back roll formed columns used in these types of racks do not easily withstand forklift impacts, negating any savings gained in the initial purchase. 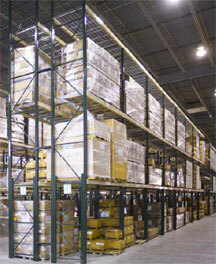 Many are turning to a design that utilizes closed tubular column shapes, such as Steel King’s SK2000 pallet rack system. This system retains the industry standard "tear drop" connection, and is interchangeable with most existing "tear drop" systems in use, but the closed tube column design generates more resistance to accidental fork truck impacts. Replacement is actually easy, as the stronger columns can often be utilized with existing load beams. "This system has been proven in an independent test to have 250% more resistance to fork truck damage," Anderson says. "The product lasts longer, and a more durable system can be an important part of an overall safety improvement program." The system has 44 times more torsional strength (resistance to twisting) and 68 percent more side impact resistance. A 3-rivet connection is used for beams, offering 26% greater strength than the standard 2-rivet connection. Heavy 10-guage footpads are welded directly to the uprights, dispersing the column load more efficiently than conventional lighter footpads. 2" beam adjustments allow for needed flexibility in load adjustment. Welds between braces and column are full fillet welds, with up to 4 times the amount of weld used on other rack systems. Also, due to no open backs on the columns, braces, or on step beams, the pallet racking also remains cleaner. This line also offers a wide variety of column sizes, a number of which are not available elsewhere. The large 4" wide column has proven very competitive in meeting new seismic design parameters specified by local building departments. For even more strength, extra damage protection is available in the company’s Column Core—an optional C-shaped column reinforcement welded inside each column. This addition further reduces puncturing, buckling and twisting, yet still allows full beam adjustability. To save cost, the Column Core can be added only where needed, usually in the lower 12" to 48" of an upright frame where fork truck damage is most likely to occur. With this addition, SK2000 boltless racks can actually have more abuse resistance than structural bolted racks. "The kind of strength available with the Column Core is pretty surprising to end users who quite often look at the bolted structural design as the ultimate in the abuse resistant rack," says Anderson. In today’s uncertain economy, new solutions such as the boltless pallet rack solve storage concerns with cost-effective reliability.